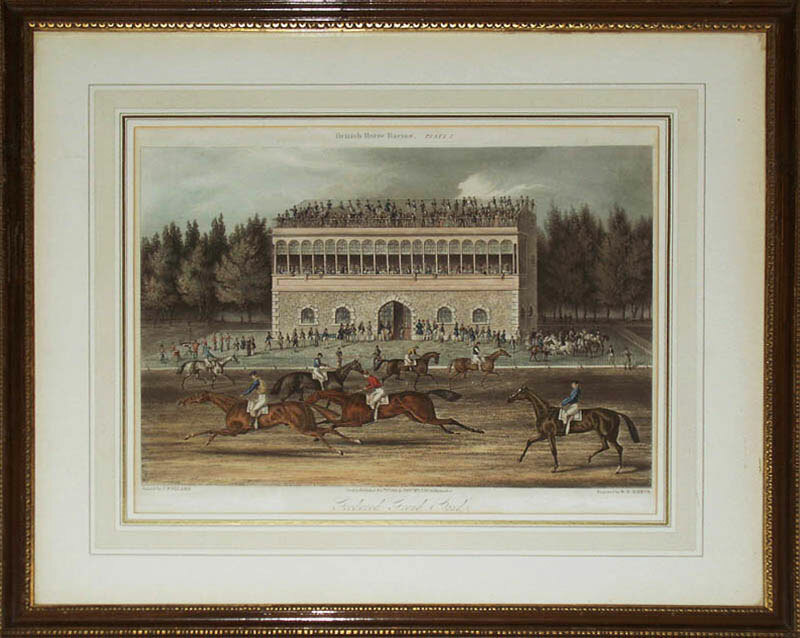 A coloured aquatint of the Grand Stand at Goodwood racecourse engraved by Richard Reeve after the painting by James Pollard and published in London in 1836. This charming plate from Pollard's series of British Horse Racing depicts the beginning of a race at Goodwood in Sussex as the runners prepare to start. Richard Gilson Reeve (1803-1889) was an aquatint engraver best known for his sporting, marine and topographical subjects. He was born in London and spent his working life in the city engraving after his contemporaries. His career coincided with the rise in popularity of the aquatint and his work was constantly in demand. James Pollard (1797-1867) was born in Islington, north London, the son of the artist and engraver, Robert Pollard. Like his father before him, he spent his working life in London painting and engraving sporting subjects. He learnt his trade from his father and between them they have become synonymous with the sporting art that came to be so popular from the late Georgian to the mid Victorian period. Few homes would be complete without a coaching scene or an equestrian study by one of the Pollards and they have remained fashionable to this day. The family business became known as R. Pollard and Sons in 1819 and it was during the subsequent ten years that James Pollard produced the majority of his engraved work.